A large brass cap that crashed through a car windshield and killed a man Friday on Highway 101 near Palo Alto came from a Caltrans vehicle, Caltrans said. 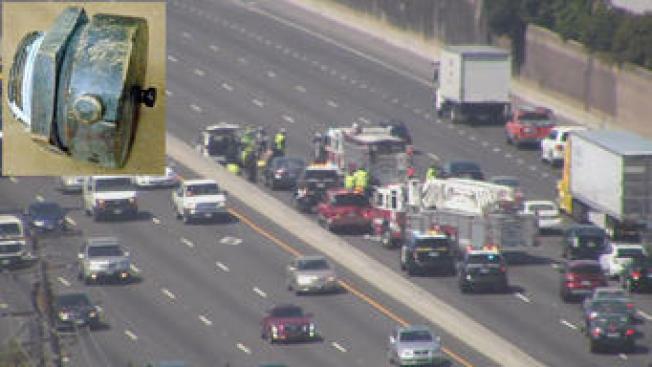 The metal cap, which is designed to be attached to the vehicle by a chain, fell off a water truck after the vehicle blew a tire, Caltrans said Monday. CHP and Caltrans are investigating how the baseball-sized cap became dislodged from the truck and why it may not have been tightly secured. "If it’s something that was loose, then we have to find out why it wasn’t checked," CHP Officer Art Montiel said. "The bolt came off the Caltrans truck and went into the minivan. We don’t know if it happened simultaneously or how it happened." CHP officers initially thought the cap was kicked up by passing traffic and struck 82-year-old Louis Schaefer, of Mountain View, on the left side of his neck as he was driving a minivan north on 101 near University Avenue. The impact prompted him to swerve and collide with the center median. Schaefer was pronounced dead at the scene. Struggling to cope with the tragedy, the victim's family issued a statement Monday. "The Schaefer family is grateful to the drivers who pulled over to try to help our father," a friend on behalf of the family said in the statement. "We are also grateful for the compassion and professionalism of the California Highway Patrol and the San Mateo County Coroner's Office. We are grieving the loss of our father." The CHP said Caltrans is cooperating with the investigation. Caltrans released a statement Monday in response to the finding in the CHP's investigation. "We offer our deepest condolences to the family of Mr. Schaefer, the victim in this event," Caltrans spokesperson Myeast McCauley said. Caltrans wouldn't comment on whether the cap may have been loose or speculate on what caused the crash, saying only that the incident is under investigation. "This event appears to be isolated solely to this vehicle. That’s why we’re working with CHP to learn how this specific piece came off this specific piece of equipment," the agency said. In a statement Sunday, Caltrans said the truck was driving between job sites at the time of the incident. Between 2011 and 2014, more than 200,000 car crashes around the country involved drivers hitting debris, according to AAA. Approximately 500 people died in those wrecks. CHP investigators said charges could be filed against Caltrans if investigators find the cap wasn’t properly secured.